The short answer to have the same lottery numbers been drawn twice – is yes, they have! The proper answer depends on which lottery game you are asking about. Because if you think about it, the chances of this happening with some games is quite likely. With others it’s like being struck by lightning 8 times in the same day! Probably the easiest lottery game to win is Pick 3. Why? Because there are only 1,000 possible different results. If you are wondering why it isn’t 999 results, it’s because you forgot about 000 :-). The results can be 000, 001, 002 through to 999. The other thing about Pick 3 is that it is not drawn just once or twice a week. Typically Pick 3 is drawn twice a day, every single day. That makes 730 draws every year! So with only 1,000 different results there can be, and 730 draws every year – it’s easy to see that the results are going to repeat fairly often. Even if a different result came out every draw and never repeated, it would take less than a year and 5 months for all the results to be used up. It’s like flipping a coin 5 times – it’s quite likely the same result is going to come up again! If you look at a game like Powerball however things are very, very different. Now we’re talking a totally insane 292,201,338 different possible results – seriously! That’s over 292 MILLION. This game is only drawn twice a week too, on Wednesday and Saturday. Which makes up only 104 draws a year instead. So with Powerball, if a different result came out every single draw, it would take an astonishing 2.8 MILLION YEARS for all the results to be used up. Feeling patient? Waiting for the same numbers to be drawn twice here really is like getting struck by lightning 8 times in a day! So Has The Lottery Ever Had The Same Numbers? We already learnt that it’s no surprise that some games have had the same numbers come up again. Some Pick 3 games have been around for over 11 years, so in that time you would EXPECT it to have happened about 8 times or more already! So no real surprise that is has happened, and it will happen again soon. For games with more balls we know it will take a lot longer to happen, because there are just so many different combinations that can appear. Look at the Powerball again. It only started in April 1992 (although technically it replaced a game called Lotto*America that started in 1988 – anyone old enough to remember that?). That’s only 25 years of draws. At twice a week that’s only 2,600 draws that have happened in total! (Pick 3 does more draws than that in just 4 years). 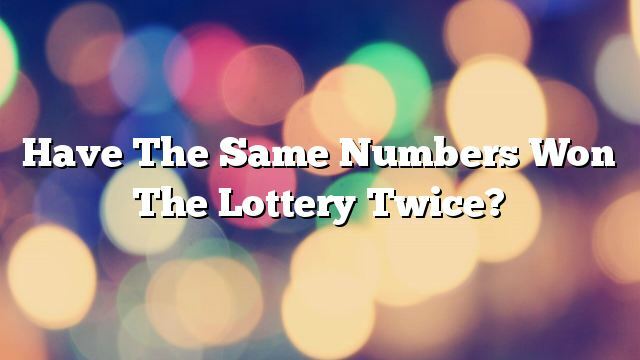 In which case if there have only been 2,600 draws – and there are 292 million possible combinations – it’s not surprising to find that Powerball has NOT had the same exact numbers repeat. It will happen one day though. We might all be long dead by then, or it might happen next week. Because it’s not that it can’t happen, or that’s it’s any less likely to happen. It’s just that everything becomes unlikely when you have so many combinations to deal with. What About The Same Numbers Two Draws In A Row? Just to illustrate how weird lottery games can be sometimes – there have already been cases where the same numbers have been drawn two weeks in a row! This happened on the Bulgaria lottery which is a Pick 6 lottery game with a pool of 1-49 balls. So even though there are over 13 million combinations, in 2009 the exact same numbers got drawn for two different draws, one after the other. There was an investigation because naturally everyone freaked out about it – but nothing was found to be amiss. The organisers pointed out that the balls were actually drawn in a different order anyway so it was just one of those things that can happen with a lottery draw. Back to more questions about lotteries and lottery systems.